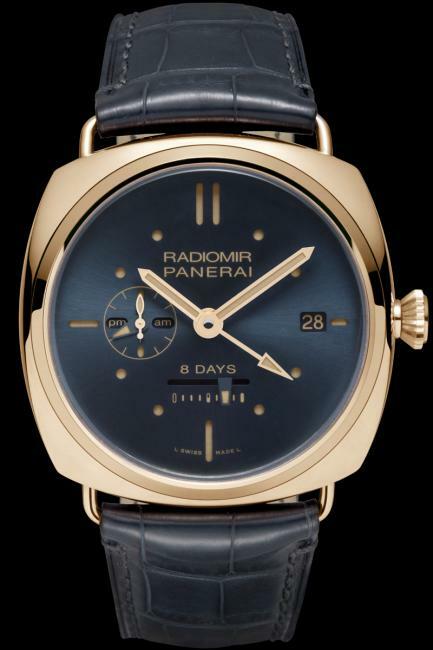 Panerai announced recently this special edition watch, the Radiomir 8 Days GMT Oro Rosso, a tribute to the classic Radiomir. We’ve seen many blue watches lately, but this is different. The harmonious combination of the deep blue dial with satiné soleil finish surrounded by a red gold case, makes this watch special. It’s 8 days power reserve alludes to the beginnings of Officine Panerai when they were making watches for the commandos of the Italian navy. It is a limited edition of 300 pieces that are sold exclusively in the Panerai boutiques around the world. The new Radiomir 8 Days GMT Oro Rosso has a cushion case of polished red gold which encloses a dial of historic inspiration, derived directly from a rare model of the late 1930s. The design of the dial is minimalist with simple linear and dot hour markers. The various functions can be read directly: the date at 3 o’clock; the linear indication of the power reserve; and the small seconds counter with a.m./p.m. indicator for the second time zone. 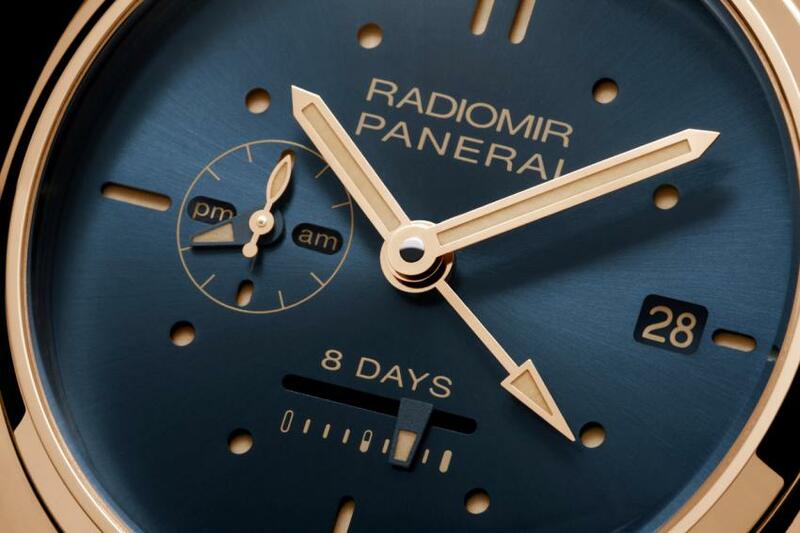 The dial is deep blue with a satiné soleil finish, elegantly set off by the warm tone of the 5Npt red gold, an alloy that has a higher percentage of copper than yellow or pink gold and a proportion of platinum. The same alloy, which provides greater toughness and strength, is used for the adjustable clasp closing the blue alligator strap, which is fixed to the case by the system of removable strap attachments patented by Officine Panerai. 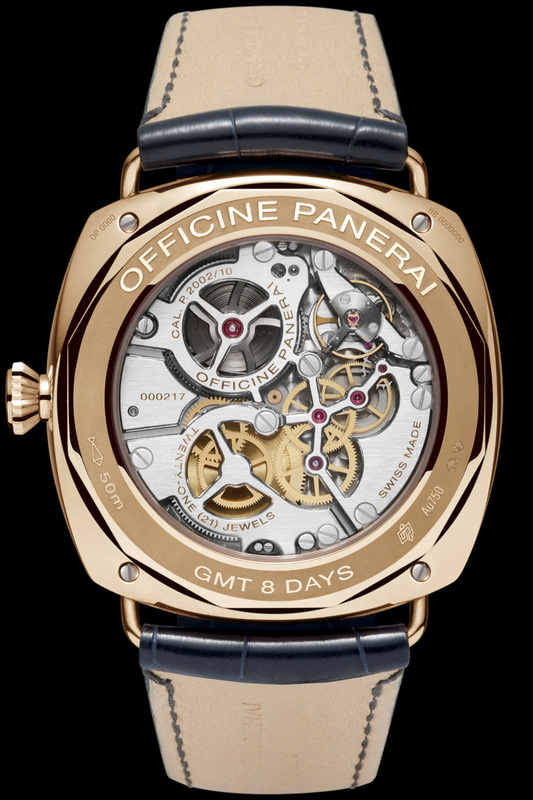 The open back reveals the sophisticated technical and aesthetic details of the hand-wound P.2002/10 calibre: this is a particularly complex version of the first in-house movement made in the Officine Panerai Manufacture at Neuchâtel. The bridges and barrels are finely skeletonised, so the details that appeal so much to lovers of haute horlogerie can be seen, such as the wheel-work in the same colour as the case, the progressive unwinding of the spring as the watch is running and its rewinding when it is being wound. The brushed bridges with gold-coloured engraving are finished with anglage (chamfering) while the plate is decorated with perlage (circular graining). Diameter 45 mm, 18 ct. polished red gold with removable wire loop strap attachments (patented). Screw-down winding crown personalized OP. Blue with luminous hour markers. Date at 3 o’clock, seconds and 24h indicator at 9 o’clock, linear power reserve indicator at 6 o’clock. Sapphire, formed of corundum, 1.2 mm thick. Anti-reflective coating. 5 bar (~ 50 meters). PANERAI personalized alligator strap and 18 ct. polished red gold adjustable buckle.